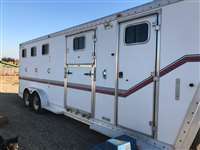 Silverado 4 Horse Extra Tall and wide. 7’8” tall, 7’ wide. Aluminum floor, rear and side ramps. Easily fits 4 17H horses. Front stall has a stud wall and a side load ramp. 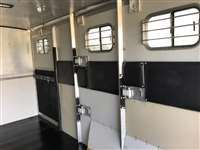 Has a movable bar to make it a standard stall size or a mare/foal 1.5x size stall. Front stall will fit a 4 wheeler. With dividers open I can fit 6 QH’s. Floor is 18’, 6’ carpeted dressing room. 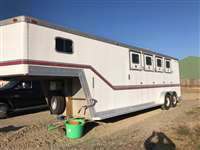 24’ total floor length. Folding rear tack but does not have saddle racks, I used a stand. Dressing room also has a plug from outside to inside to allow use of a generator or plug it in and have an outlet for camping or overnights. Very versatile trailer. Brakes and bearings were checked last year and said were good. Tires were new 4 years ago and we haven’t put a lot of miles on it. Hauls great, love this trailer! Only selling because we upgraded to a LQ.